My Review: This book is even more beautiful in real life than it was online! The edges of the pages have that worn effect that makes it appear old and tattered. I love it! There were so many words on one page I actually had to put my reading glasses on for this one! I love the page breaks between chapters. Each one a different phase of the moon. It just the book even more of a wolf feel. Straight to the point. We meet Calla Tor already in mid-fight. Sometimes getting a little background story is nice but other times, getting right down to brass tax is just what the doctor ordered to break a reading slump! The way Andrea Cremer writes is poetic. Beautiful metaphors that really bring the scenes to life. I was pleasantly surprised to discover that the characters of the story are more wolf than human. They don't consider themselves humans that turn into wolves, more like wolves that take human form. The world in which these wolves are a part of is so much more intricate than I've read in any other story. 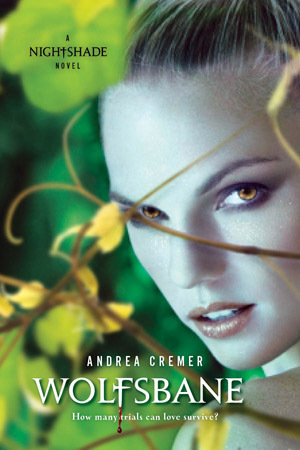 Andrea Cremer created a wide variety of colorful characters. She reveals bits and pieces of them like a slow leak and it just makes you even more curious. You can tell they all have interesting background stories and because you don't get it all, it adds to the mystery of the characters. Like Cosette! What's the deal with this sad little puppy?! I don't think she says two words in the whole book! I'm dying to know more about her! Poor Calla. Torn between two gorgeous men that are both head over heels for her, would and have risked their lives for her and can barely keep their hands (and lips) off of her. Did I say "Poor Calla"? I meant Lucky B*tch! Renier Laroche, hot alpha wolf. Unlike Calla, this guys been around the block and is rumored to be a great lover. But now that their union draws near, he's into Calla and their pack 100%. This is who Calla was born to be with, this is where she belongs. Shay Doran, hot mysterious human. He caught her attention immediately and stirred up feelings within her she didn't know she could feel, and all she wants to do is explore them - with him! The whole time I'm reading this book, with everything that was happening and all the foreshadowing, there was so much build up, so much suspense, I was all anxious and twitchy! So much action! So many paranormal creatures! I couldn't wait to get to the end! And whoa! Talk about cliffhanger! 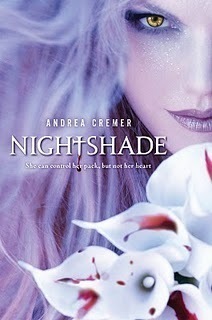 But that's okay because Wolfsbane (Nighshade #2) will be released July 26, 2010! Take a look at yet another gorgeous cover! Can they get any better? Who Should Read This Book: If you love wolf stories, this a book you absolutely cannot miss. Great love story, great action and great suspense! This book is by far at the top of my waiting list!